The Vedanta Society of Southern California is affiliated with The Ramakrishna Order of Kolkata, India. The Order was inspired by the great Bengali saint, Sri Ramakrishna. Sri Ramakrishna, his wife Sri Sarada Devi (also referred to as the Holy Mother) and Swami Vivekananda, (Sri Ramakrishna’s most widely-known disciple) are our primary teachers. When you enter one of our temples, you will see a photograph of one of India’s spiritual giants, Sri Ramakrishna (1836-1886). 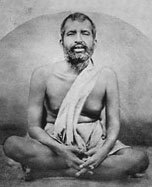 Ramakrishna was constantly absorbed in the thought of God. He would often go into high spiritual states where he would merge with the Infinite Reality. For him, the Vedantic teaching of unity of all existence was more than theory; he literally saw, and knew, this to be true. Learn more about Sri Ramakrishna here. The affe ctionate term “Holy Mother” refers to Sri Sarada Devi (1853-1920), Ramakrishna’s wife and spiritual counterpart. 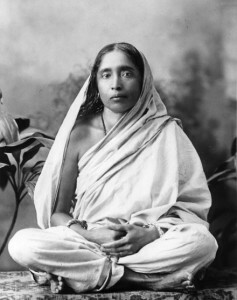 Sarada Devi was a spiritual giant in her own right and yet, in her simple and unassuming way, she served Ramakrishna and his disciples for many years. After Ramakrishna’s passing away, she carried on his religious ministry, serving as guide and inspiration of the new spiritual movement. Learn more about Holy Mother here. Swami Vivekananda (1863-1902) was the foremost disciple of Sri Ramakrishna and a world spokesperson for Vedanta. Swami Vivekananda represented Hinduism at the first World Parliament of Religions in Chicago in 1893 where he was an instant successas he was a man with a great spiritual presence and tremendous intellect. After his first visit to the West, Swami Vivekananda returned to India and founded the Ramakrishna Order in 1898. Most of the Vedanta Societies which were founded in America and Europe up through the 1930s can trace their origins directly to Vivekananda or the people who heard him speak from 1893 through 1900. Learn more about Swami Vivekananda here.